We're spending over a billion dollars a year to drive security improvements, says Yusuf Mehdi, corporate VP at Windows and Devices Group, Microsoft. At its recent Ignite event, Microsoft made a number of announcements that further its moves in cloud, intelligence and security. It also revealed that, as at end September (14 months after the official release date), Windows 10 was running on 400 million active devices. 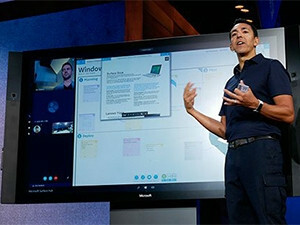 A key announcement made at the event in Atlanta, US, was that Microsoft had entered a strategic partnership with Adobe. The deal is focused on working together to help enterprise companies improve customer relationships through personalisation - notably enabling closer ties between Adobe's Marketing Cloud and Microsoft's Dynamics 365. Adobe also announced that Microsoft Azure will be the preferred cloud platform for a number of Adobe's solutions. "We are going to be delivering all of our clouds, the Adobe Document Cloud, the Marketing Cloud and the Creative Cloud, on Azure, and it's going to be our preferred way of bringing all of this innovation to market," says Shantanu Narayen, CEO of Adobe. Further detail was also revealed about Microsoft's strategy to enable client enterprises to move to the cloud in a hybrid approach. Windows Server 2016 and System Center 2016, launched this month, help to upgrade the on-premises infrastructure in preparation for the cloud while letting customers run their existing applications. "We think of Windows Server 2016 in many ways as the edge of our Azure Cloud," says Scott Guthrie, executive VP of the Microsoft Cloud and Enterprise Group. Windows Server 2016 includes new security features, such as Shielded Virtual Machines, which uses the BitLocker encryption technology to encrypt virtual machines. As well as support for container development, through a partnership with Docker, it also features Nano Server, which is a lighter variant deployment of the operating system which is faster, making it better suited to a virtual or cloud environment. Systems Center 2016 provides a simplified management solution that spans the local data centre and cloud. While Operations Management Suite has been available for over a year, new updates enable monitoring functions similar to those offered in Microsoft's public cloud platform Azure. These allow administrators to manage on-premises and assets in the public cloud from a single solution. Bringing the Azure experience even closer to home, Microsoft also launched the second technical preview of c, which allows customers to adopt Azure technology within their own data centres and provides a more consistent experience. Thanks to its own network of data centres, Microsoft has also been working to make Azure the foundation for the world's first AI supercomputer. Using a deployment of custom developed field-programmable gateway arrays (FPGAs) in 15 countries across the world, Microsoft hopes to accelerate AI to near real-time. "While many companies are experimenting with much smaller scale, bolt-on systems, Microsoft is the first to have its global hyper-scale cloud enhanced with post-CPU technology, in this case FPGAs. It gives us the most powerful cloud, the most flexible cloud, and the most intelligent cloud," says Doug Burger, distinguished engineer at Microsoft Research NExT. Intelligence is a key focus for Microsoft's strategy, and sits at the intersection of its ambitions. "We've used technology very successfully to democratise both creation of information and the distribution and access of information. And now we need to turn to technology to democratise creation and access to intelligence," says Satya Nadella, CEO, Microsoft. He went on to explain how intelligence is integrating into Microsoft's product suite: "[Intelligence] shows up as handwriting recognition on Windows 10, or the Windows Hello feature, the ability to face-recognise you, or even magical new devices like the holographic computer, where you have the ability to digitally reconstruct and recognise everything that you see and then to superimpose objects in that world." Nadella further revealed that in order to democratise AI and make it more widely available, Microsoft is making 'the building blocks that constitute intelligence are available as developer services in Azure'. As intelligence is being infused across its various products, so too is security being added across the board. "We're spending over a billion dollars a year to drive security improvements," says Yusuf Mehdi, corporate VP, Windows and Devices Group, Microsoft. The Windows Defender Advanced Threat Protection and Office 365 Advanced Threat Protection now share intelligence mutually across both services. Office 365 Advanced Threat Protection also includes URL detonation, which analyses links in real-time to identify unknown malicious URLs. Windows Defender Application Guard has also been launched, which isolates the Microsoft Edge browser and employee activity using a hardware-based virtual container to prevent malicious code from infecting the device and moving across the network. Further news included the launch of Enterprise Mobility + Security E5, to secure data in the mobile and cloud worlds, and Microsoft Azure Information Protection service to help organisations classify, label and protect sensitive data. Mehdi says Microsoft has an Intelligent Security Graph to provide a holistic platform to protect all of the critical endpoints and help identify coordinated security attacks on the network. This graph is then combined with human expertise, through its Cyberdefense Operations Center and Digital Crimes Unit.